1. Play it loud during class change. Make students wonder what’s going on in Spanish class! 2. Play it soft while students work. Music helps create a positive learning environment! 4. Do a lyrics cloze. Here’s the cloze I made for Tengo tu love, one of my students’ favorites. Sometimes I number the verses to make it easier for students who get lost to find their place again. 5. 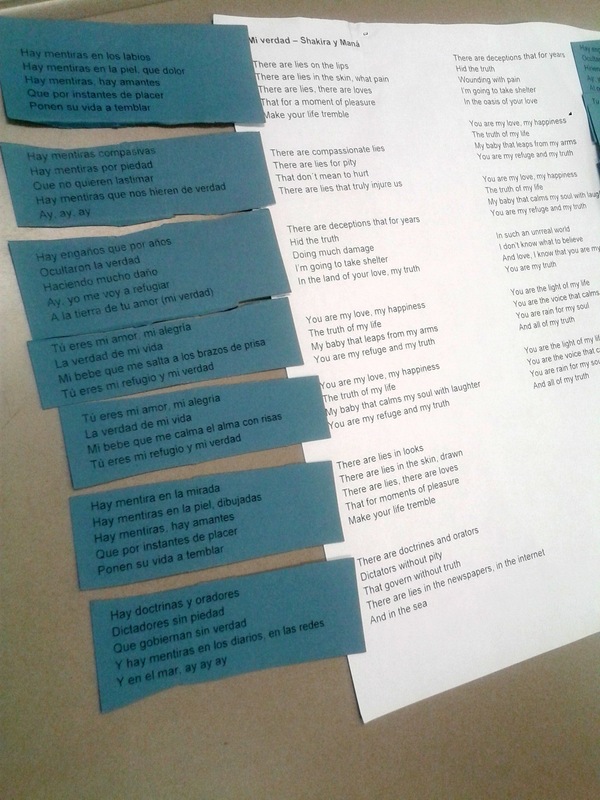 Cut the lyrics out, and have students arrange them in order. I love this activity, but it is high prep! It is slightly less work if you can get students to do the cutting for you. You can do individual lines (maybe just the chorus? ), or do blocks of lyrics, like in the picture below. Or after doing a cloze, project a the translations of a few lines, verses, or the chorus on the board, and have them write the number on their paper next to the correct part of the song. Easy-peasy. 7. Follow along with a print out of the lyrics, or watch a lyrics video. There are tons of lyric videos on youtube, or you can use a lyrics app on spotify, such as musiXmatch. 8. Play lyrics training – this would make a great station or homework choice option! 9. Knock on your desk when you hear _________. So I used to teach Zumba, and I got this wonderful song for physical descriptions on my choreography CD, “Me gustan todas“…about six months after I had taught descriptions. I still wanted to play it, so I fit it in at the end of class one day, and just had students listen for countries and knock on their desk every time they heard one (well, I said “knock”, but they heard smack as hard as you can. Anyway, they paid attention to the song, which was my goal all along! bahahaha :). Maybe you could have them knock every time they hear yo, or each time the chorus starts, or if there’s a distinct instrument? 10. Make a bracket and vote on your favorite. What did I miss? What are your favorite ways to use music to teach language? Quote | This entry was posted in Music in Spanish Class and tagged Teaching with music. Bookmark the permalink. Great ideas! Thank you so much for sharing them. I couldn’t open the “Tengo tu Love” cloze, but that’s no big deal. My students absolutely love activities with music. Hmm. I just tried and the linked worked. Would you like me to email it to you? –Draw a pic to show the meaning of songs (poems) that use lots of imagery. –This one is a variation of your #7 and #9. Give a handout with list of phrases from the song and have them circle when they hear them. For lower levels, you may wish to keep the phrases in order but can mix up some to make more challenging. –Rewrite the song by giving them the chorus or a stanza or two but with blanks for them to insert different verbs, nouns, adjectives, names, etc. Results can be really fun. Lyrics Training seems great. Can you pick songs to upload or does the site have them already? Does it search YouTube? From what I can tell, you are limited to what they have available- I don’t see an upload option. It is mostly popular, recent songs and well-known artists. It does use videos from youtube, so definitely pre-view before using in class. Anyone have a link to several songs that work well for first year? Dustin Williamson and Maris Hawkins have also shared PDF packets of songs with activities by level. Just google their name and Spanish music and you should be able to find it. Good luck! When do you teach “Tengo tu Love?” What level? What chapter in Realidades? Would love to see a list of songs you teach for each section in Realidades Year 1. Thanks! I don’t follow Realidades exactly, but I do the “gist” of PE, and chapters 1-4A. I teach a bit of 4b sometimes with stemchangers, as well as family vocab with ser/estar. I do the physical descriptions vocab (also in 5a?) early, right after teaching greetings. That’s when I do Tengo Tu Love – it works to reinforce Tengo perfectly. That being said, you don’t need a grammar or vocab reason to do a song – if it’s catchy and students will like, it’s probably worth doing! Thanks so much, Andrea. I would love to be able to use one pop song per section I teach for Realidades that relates to a linguistic concept we are learning. 🙂 Just started following you and love the posts so far! Lilian, here is my Spanish 1 playlist. I will need to work on a blog post about the songs I use! How do you use Gozadera? Such a fun video! Love it!!! !